Instead of purchasing separate adapters and converters, you will like the convenient way to connect your keyboard, mouse, printer, LAN, USB and serial devices to your notebook or PC. The Multi-Function USB 2.0 LAN DOCK including the most common ports in one package offers the space solution to your needs. The Multi-Function USB 2.0 LAN DOCK not only connects all your desktop peripherals with a single device, but also the latest higher performance peripherals, such as high-resolution video conferencing cameras, scanners and printers. 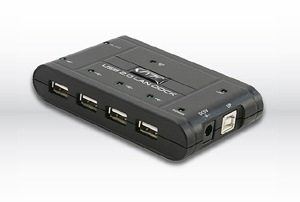 With the Multi-Function USB 2.0 LAN Dock, you can extend and organize your PC world.